A major search was launched to find a group of 15 walkers missing on England’s highest mountain. Wasdale Mountain Rescue Team was called out at 8.05pm yesterday after the group came off Scafell Pike and into upper Eskdale. 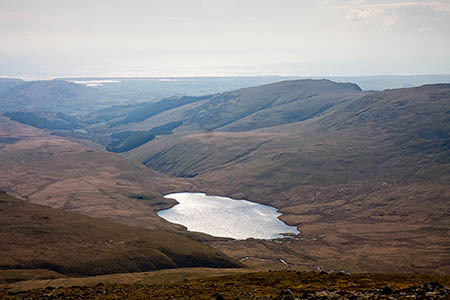 A detailed night-time search involving 27 team members was carried out on the Eskdale side of the mountain before the walkers were found near Burnmoor Tarn, west of Scafell. Team members walked the party off the fell and down to Wasdale Head, with the rescue ending shortly before midnight. Quite how you manage to get that far lost is a mystery. You would have had to bypass Scafell (did they not notice it? )Unless of course as usual no map, no compass or if they did absolutely no idea how to use them. Two recent incidents. Last weekend a bloke appeared at the top of Causey Pike and said (in Australian accent), "What's the name of this feature?" Someone told him it was Causey Pike, , "oh good! I'll try to remember that!" and promptly set off walking again. He had no map with him. We did see him again about eight hours later on the descent of Grisedale Pike. Where he had been I do not know. At the top of Wetherlam a few weeks back, (it was a clear but very cold icy day and there was also reasonable amount of snow around) A lady approached me with no rucksack or map or anything else and asked me the way back to Coniston. Using my map I did my best to explain, but the mind just boggles at some of these people. I have had to read this one several times and still cannot understand why MRT were required! Not a single navigator or torch among the 15 ? As the mother of one of the 15 students (who were accompanied by their teachers) it is sad for me to see some of these comments from those who do not have accurate details about what happened to the group, their lack or otherwise of essential skills and equipment to undertake the walk and the inference about lack of brain cells!!!!! !.....I am however eternally grateful that there are dedicated men and women who are willing to give up their time to support walkers who get into difficulties. Donation on its way with heartfelt thanks. Good to see there all safe and well, but the worrying words students and teachers , so why no qualified instructor ? Prehaps the y should have had at least one with them , or the teachers should have known better. Ther e have been some terrible tragic deaths of students in the uk , and prehaps the teachers should do a bit of history and not risk being part of a potential tradgedy again. To the parents im so happy that the students are all safe . Big thanks to mrt again . Hill walking is not a 'time filling' activity. It is a fulfilling risk and reward activity. If you aren't prepared to accept the risk then stay safe in risk averse arenas. This is spring time in the hills. The downside for these chumps was an educational and uncomfortable night out, never life threatening. Take your medicine guys and gals, how else will you learn. And, yes, I too have spent uncomfortable nights out in the cause of my education and, never, for one second did I consider bleating for the rescue. If the article is accurate, they must have got from Upper Eskdale to Burnmoor Tarn before needing MRT help - so they probably contoured round below Slight Side and droppped down somewhere near Oliver Gill. That would be a very sensible route to take if you realised you had reached Upper Eskdale instead of Wasdale Head. If they lacked any experience of walking in the dark, and had an inadequate number of torches as well as being rather tired by then, it's understandable that they might struggle to manage the last 2 or 3 miles down to the head of Wastwater. I can imagine them sitting tight in group shelters or something. Assuming they had no mobile signal, all it would take is someone in the valley to call out the Mountain Rescue because they were late back, and you have a complete explanation without any "bleating for the rescue". A navigational mistake made, a nearly successful attempt to recover the situation, and some valuable experience gained. Maybe the teachers went on strike.